In this photo taken Nov. 1, 2018, Turkish and U.S. troops conduct joint patrols around the Syrian town of Manbij, as part of an agreement that aimed to ease tensions between the two NATO allies. The observation posts are aimed at ensuring that Turkey and the SDF remain focused on clearing final Islamic State strongholds. 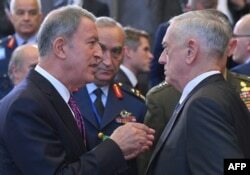 FILE - Turkish Defense Minister Hulusi Akar, left, speaks with U.S. Defense Secretary Jim Mattis prior to a defense ministerial meeting at NATO headquarters in Brussels, Oct. 4, 2018. “We are putting in observation posts in several locations up along the Syria border, northern Syria border, because we want to be the people who call the Turks and warn them if we see something coming out of an area that we're operating in,” Mattis said. “What this is designed to do is to make sure that the people we have fighting down in the (middle Euphrates River Valley) are not drawn off that fight, that we can crush what’s left of the geographic caliphate,” Mattis said, referring to areas controlled by Islamic state. President Donald Trump’s administration hopes that the U.S.-backed fight against Islamic State in its last foothold in northeastern Syria will end within months but a top U.S. diplomat recently said American forces will remain to ensure the “enduring defeat” of the militant group.